PROJECT: Name a new entertainment and social action television network that will air feature documentaries, reality TV, drama series, variety shows and an open source talk show. PIVOT: Beyond just turning and rotating, Pivot is the one central thing that something — maybe everything — depends upon. It can be a structured course correction or a re-alignment of priorities. Pivot is all about thinking on your feet, adaptation and informed change. Also connotes pivotal, as in being of critical, essential importance. BRAND POSITION: The Pivot brand is empathetic, and connotes the dance of collaborators — auteurs and audience — learning to work together, to understand and inspire each other. The Pivot network doesn’t strong-arm or browbeat you, it uses compelling, entertaining stories to get the audience to gently pivot in their thinking, and to inspire them to action. The world is changing, and Pivot will be right there in the middle of that change. 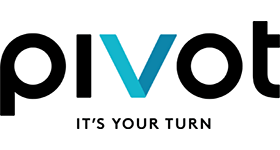 And with its innovative digital distribution strategy, Pivot may just turn the television industry upside down as well. The name Pivot is perfect for this ambitious network that is both television and post-television. The old ways of thinking, acting and relating to each other and the world are not working anymore. It’s time to Pivot. Several of our fantastic clients have been interviewed by the researchers at Clutch for reviews about their experience working with us, including Éclair. Read the full review, and those from other clients, on our References/Testimonials page.